When you think of warehouse stores, Costco is probably the first one that comes to mind. This is to be expected, as Costco is the heir to the Price Club, which was the first and original warehouse store chain. But as huge as every Costco store can seem, they are backed-up by a distribution network of facilities even more enormous. These distribution centers are called “Depots” by Costco, and there are jobs to be had there, although they are far fewer in number than the jobs in the retail stores. To put it simply, each retail store employs more people than a Depot, and there are far more retail locations than Depots. Costco was founded in 1983 in Seattle, by two partners named Jim Sinegal and Jeffrey Brotman. Sinegal had gained experience in wholesale distribution while working for Sol Price both at Price Club, and at Fedmart. Over the next 10 years, the company grew until it was able, in 1993, to achieve a merger with The Price Club itself. This merger became a takeover, in effective terms, when Sol Price and his son Robert left the combined company. Today, Costco has 604 warehouses, with 437 in the USA, 82 in Canada, 32 in Mexico, and the other 55 in various international locations in including Japan and South Korea. The company has over 140,000 employees, and annual revenue in excess of 77 Billion US dollars. You will need to be 18 years of age, and submit to a background check, and you will have to go through the E-Verify process to verify your eligibility to work in the US, but there is no heavy lifting requirement listed among the requirements for working at a Costco Depot. They also prefer, but do not absolutely require, that you have a high school diploma or GED, previous warehouse experience, and good mechanical aptitude, as well as at least basic computer skills. Most Costco Distribution Centers are called Dry Depots, but there are also Wet Depots. The former simply means a place where things are stored indoors, and the latter is simply a lot where they are stored outdoors. There is also one Pacific Rim Depot, located in Mira Loma, California, which handles all goods imported via the Pacific Ocean. In fact, if you look closer, you’ll find that Mira Loma has a Wet Depot and a Dry Depot, both at the same address as the Pacific Rim Depot. This is obviously a very large facility; see the picture below. Costco is currently embarked upon a major building program, with at least 10 retail locations under construction, so a new depot or depots may be added in the near future. The list below includes all 12 current Costco Depots, listed alphabetically by state. Each of the cities above is the site of a Dry Depot, although some have a Wet Depot at the same address. In no case did I find any evidence of a Wet Depot existing alone. 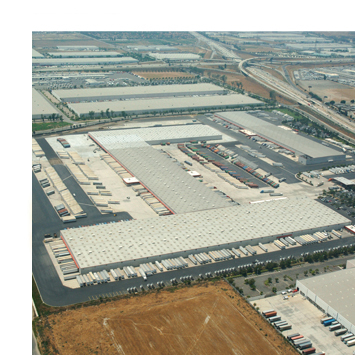 As mentioned above, the site at Mira Loma, CA is also the location of the Pacific Rim Depot. For the record, there is also a depot in Hidalgo, Mexico, and another in British Columbia, Canada. Now would be a good time for you to go and read the general article on Distribution Center Jobs, (provide link here when article is published), if you have not already done so. Costco has a practice of calling most employees at a depot “Power Equipment Operator” rather than giving them a more job-specific title. But if you read the job description, they have you doing everything under the sun. The other specific job title that concerns us is “Order Picker”. This is a position dedicated to filling high-volume business orders which are filled directly from the depot, rather than from a retail location. As such, you operate in parallel to the general flow described below. Basically, you get a pick list, you grab an empty pallet and a pallet jack or electric forklift, you take smaller quantities of items from the break-down area described below, or you enlist the help of a forklift operator to retrieve pallets from the pallet racks for larger orders, you assemble the order and fill out the pick list, then move the order to the Audit Area, where it is double-checked before being delivered to the customer. Unloader – You unload incoming trucks, and place the pallets for the Receiver to check. Receiver – You check the pallets as they are unloaded, by shooting them with an inventory “gun”. Hauler – You haul the pallets to the warehouse after the Receiver checks them in. Put-Away Driver – You drive a forklift in the warehouse. As the Hauler brings you pallets, you shoot them with an inventory gun, again, and then stow them on the pallet racks. Replenishment Driver – You are the counterpart of the Put-Away Driver. You pull pallets from the pallet racks, and place them in a break-down area where they can be used to fill orders. Order Filler – When the Replenishment Driver brings you pallets of goods, you sort them out and group them by store and department, as needed to fill orders from the retail stores. Loader – As the orders are filled by the Order Filler, you load the pallets into outgoing trucks for delivery to retail locations. A review of anonymous feedback from current and former Costco employees shows a level of employee satisfaction well above average, and the same anonymous feedback reveals that 90% “approve of” CEO Craig Jelinek. Costco Depot, Mira Loma, CA. Look carefully at all those little lines, and realize that each of those is a 40′ semi-trailer. This is a truly enormous facility. First thing, have a look at the list of 12 Depots above, and see if you live near one. If you do, have a look at the Costco careers site, and you’ll see a list of the jobs available at a depot, all four of them – the two described above, and two classes of semi-truck drivers. You can click on either the Order Picker position or the Power Equipment Operator position to see a full-page description. When you scroll all the way to the bottom of that detail page, you’ll find a link inviting you to apply by choosing a location. Clicking on that will take you to a page with two simple drop-down boxes to choose state and city. You can just ignore the zip code box. The only 10 states on the list are those with Depots, and in most cases each state will have only a single city you can choose. Only California and Texas have two depot locations. Average wage for a Power Equipment Operator is $13.07 per hour, with reports varying from a low of $13 to a high of $14 per hour. Average wage for a Order Picker is $11.17 per hour, with reports varying from a low of $11 to a high of $13 per hour. Applicants report a fairly straight-forward hiring process, usually two interviews and a drug test. Some applicants being interviewed by two managers at once. Most applicants who applied online report a fairly prompt call-back for an interview, sometimes as soon as the next day. And there you have a summary of what you need to know to get that Costco Distribution Center job. If you live in one of the right areas, these are potentially very good ways to launch your career. The starting pay is well above minimum wage, benefits are good, and Costco is known to be very big on promoting from within, so the sky is the limit.